At a seminar in the aptly named “Disruption Hall” at startup space Epicenter, Schmidt had a “fire-side chat” with former Swedish prime minister Carl Bildt – a self-proclaimed techno-optimist. You guessed it, there were not many critical questions, rather the accomplished gentlemen spent the time congratulating one another on the success of technology and chuckle at the (few) things they got wrong. Nevertheless, Schmidt did comment on some of the current topics relating to Google’s business. Bildt asked Schmidt to “look back 20 years” and say what he was wrong about. “Two things”, said Schmidt. “I was wrong about the rate of adoption of the internet. It has been much faster than what I foresaw. And how governments would misuse and get involved in the Internet. China, Russia. Carl Bildt commented that some governments fear the Net. Bildt said there are evil people online as well as offline, that it is a reflection of how the world is. When Western governments ask companies like Google to redact content, they act just like China. This conversation is a very good illustration of the ideology of internet exceptionalism: the internet is different and must be protected from government, which can only do harm. The real question is: how did we ever come to believe that the internet would be best served with no rules, when we have them everywhere else? It’s also like a time-warp: does anybody buy this anymore? After Snowden, Macedonian troll farms, Russian hacking of the US election, filter bubbles, hate speech, fake news, sexual harassment, Gamergate and scores of other problems directly or semi-directly related to the lack of rules, responsibility and transparency in the internet platforms. The real question is: how did we ever come to believe that the internet would be best served with no rules, when we have them everywhere else? Schmidt speaks of history, but this view on technology lacks history. Schmidt appears to believe that the internet was there and it was beautiful and then governments came along and stained it. But that’s not how it happened. The research that led to the internet was funded by the US military in the 60’s (=tax money). The world wide web was invented at the CERN particle accelerator research center (=paid with tax money). Innovations like micro-processors, GPS-satellites, touch screens and many other things, also paid for with tax money. If the tax-payers paid for it, shouldn’t they also have a say in how it’s used? Even the Silicon Valley venture capitalists rely on tax money. This is also the case today, next digital generation technologies like 5G connectivity, additive manufacturing, internet of things, artificial intelligence, quantum computers et cetera are paid for to, a large extent, by public research funds. If the tax-payers paid for it, shouldn’t they also have a say in how it’s used? That’s not going to send us down the slippery slope to a Chinese surveillance state. Democracies have transparent institutions, legal certainty and protection for human rights. They don’t always get it right, but the ambition is there. Huge difference! Schmidt also gave his view on artificial intelligence, robots and automation. He doesn’t think we have to worry about jobs, considering the demographic challenges ahead, productivity increase is the answer (this is a point Netopia agrees with, more on that soon). Schmidt also said that with the new encryption technologies Google applies, there is no need to worry about NSA reading your e-mail (of course, Google reads it but that is only for advertising purposes). Of course, this thinking does not help those users who lack cyber security skills of their own. And it’s not true that NSA hacked Google, they worked together albeit maybe Google begrudged it. Mr Schmidt, What about the Russian propaganda adverts. Another question from the floor concerned lack of trust in how big data companies treats user information. “We would suffer natural reputational damage if we were to abuse data”, was Eric Schmidt’s response. Of course, reputation only matters if there is competition, which is hardly the case in the markets of search, e-mail and online video that Google dominates. Have no fear, trust Google. They won’t repeat the mistakes made. Every problem has a technological solution, never a democratic or legal solution. Regulation can only do harm. The question is how much longer this argument is possible to make. Increasingly the idea of Silicon Valley fixing the world’s problems is changing to an image of greedy monopolists who may create more trouble than they fix. And when you [Google] say organize the world’s information , are you really saying “control and monetize”? Wired magazine spent a whole issue on this new view of tech. 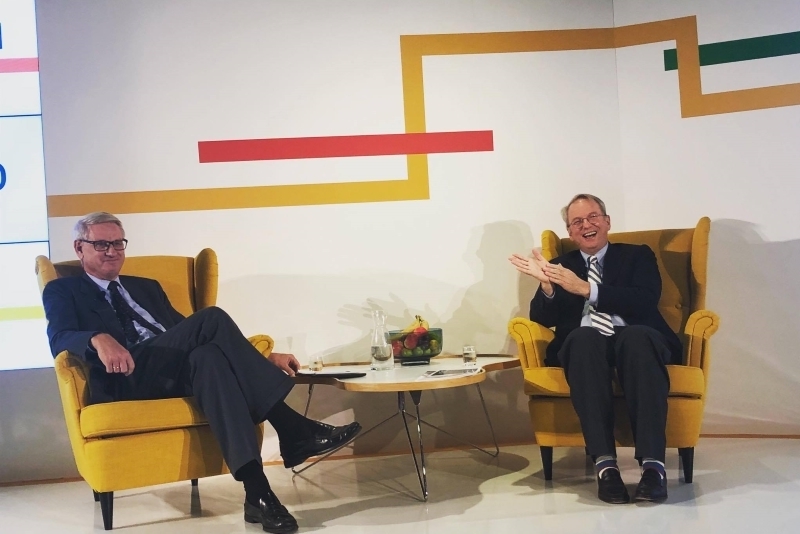 The cozy Schmidt-Bildt conversation made this writer think about Google’s famous mission statement “to organize the world’s information and make it universally accessible and useful”. Isn’t the problem right there, in those words? Is all information really something that should be universally accessed and used? All of it? And when you say organize, are you really saying “control and monetize”?